An attractive and well-laid-out garden adds to the beauty of any home. Thus, maintaining your garden throughout the year is especially vital. 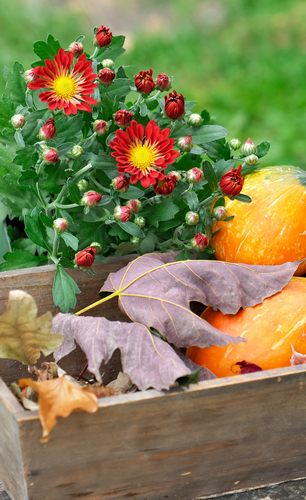 It is important to pay extra attention to your garden during fall as it helps prepare for the harsh winter ahead. These 4 simple steps will outline what you should do to ensure a healthy plot through the fall, winter and into spring. The first step in garden maintenance during fall is to allow p erennial plants the chance to grow, instead of cutting them early. Cutting them will leave the plants exposed to the fluctuating temperatures typical of the fall season. Make use of the fall season and use a simple hedge trimmer to remove broken and damaged branches of trees and other plants before the onset of snow. During the next few months, water your plants to lower damage that will be caused during winter. The active plant roots will absorb and store all the water and will make use of it to get through the winter. Collect all the dead leaves in your garden and turn them into an organic soil conditioner, which will kill weeds and help plant growth throughout cold weather. Use wire/tree guard products: Make use of wire or tree-guard products to protect the soft bark of trees from critters and the harsh cold. Keep rodents away: In order to keep rodents away from plant roots, add 6 inches of organic mulch after the ground freezes. Organic mulch includes hay, leaves and wood chips. Use more mulch: During fall season, mulch is also added as an insulation layer on top of the soil. The insulating mulch will keep the frost away and preserve the tender plant roots. Make use of these tips to maintain your garden during this autumn season and prepare it for the winter weather ahead. If you would like more advice on soil conditioners, gardening tools or other fall yard prep, please feel free to contact one of our sales reps who would be more than happy to help!